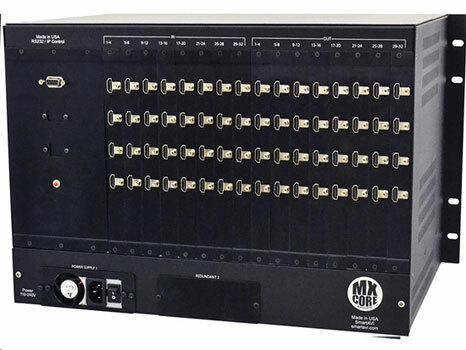 The MXCore-HD HDMI matrix router allows users to distribute and route inputs from various HD sources onto multiple HD displays. Offering high-resolution support of up to 1080p as well as 7.1 digital surround sound audio without any loss of picture clarity and eliminating ghost imaging. The HDMI advantage allows the transmission of both audio and video signals simultaneously through a single cable. The HDMI cable is automatically equalized and can compensate the long distance by reducing the number of additional input signals required. 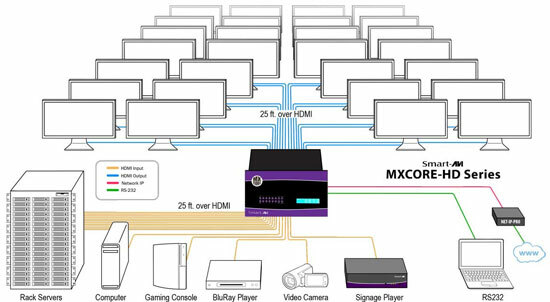 MXCore-HD series also supports HDMI 1.4 while conforming to HDCP standards and DVI 1.0 protocols with 12-bit color depth of all HDTV resolutions including 1080p/60 and 1920 x 1200 for PC resolutions.